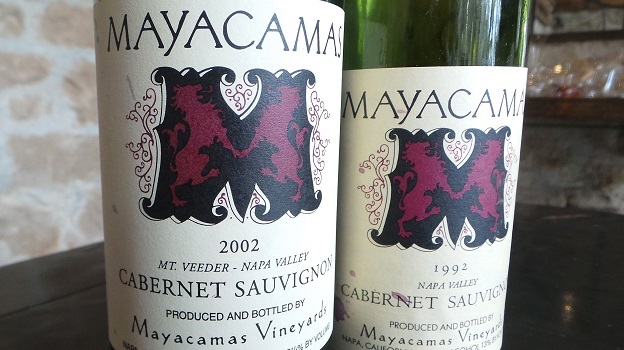 Over the years I have been fortunate to taste more than my fair share of Mayacamas Cabernet Sauvignons. These rugged hillside sites on Mount Veeder are capable of yielding some of the most intriguing and age worthy Cabernets in Napa Valley. When the wines are on, they can be magnificent and at times even profound. But Mayacamas Cabernets also show a high level of variability, much of that the result of bottling cask by cask, a practice that was once common throughout the wine world, but that is now rarely seen at top estates. As Mayacamas fans know, one of the allures of the estate is that Bob Travers and his family pretty much left things alone during their period of ownership, which spanned more than fifty years from 1967 to 2013. I tasted these two wines during a visit to the property in September 2014. Other bottles, also from the estate’s library, have been less impressive. The 2002 Cabernet Sauvignon is just beginning to enter the early part of its maturity, but ideally it needs more time in bottle. A refined, lifted wine, the 2002 Cabernet Sauvignon is fleshy and racy, but not as rich or ample in style as most wines of the year. As deeply satisfying and pleasurable as the 2002 is today, its best days almost certainly lie ahead. 94/Drinking window: 2017-2032. Dark cherries, plums, earthiness, tobacco, menthol and crushed leaves are some of the notes that meld together in the 1992 Cabernet Sauvignon. Ample and broad on the palate, the 1992 delivers gorgeous texture, expressive inner perfume and tons of nuance. Hints of cedar, rosemary and sage wrap around the expressive finish. I don’t see the 1992 improving much from here, but it does have enough depth to stay at its current plateau of maturity for another decade or so. 91/Drinking window: 2014-2024.